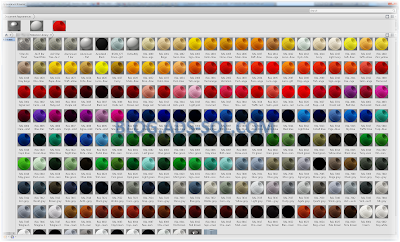 No time for a regular post or a video but I’ve got a small ilogic code to share on how to create and edit custom tables on drawings. I am doing half a dozen tanks a week and each need to have a couple of tables with nozzle connection and tank specifications. The tank is done as ilogic component that I clone along with the drawing each time a new one is needed. All the info comes from the model and if they are not present then we prompt the user for the values to fill in. It is better if you place and position the table before running the code otherwise it will show up somewhere in the lower left corner, (you can always move it of course). If you do place the table first even if it doesn't have the correct info the code will find it and will edit it. I am using table name as my search criteria when going through all the custom tables on the drawing. The limitation would be having two custom tables with same name because it stops at the first one so, although obvious, make sure you have different names for each of your table; can’t call them all “table”. If the table is not found then we are creating it and then we run the TableCheck again in order to find the table number to edit. It’s pretty much the same for the Tank Connection Details so I won’t post that but the code for this one is down bellow for all those search engines and linked here for you to download. 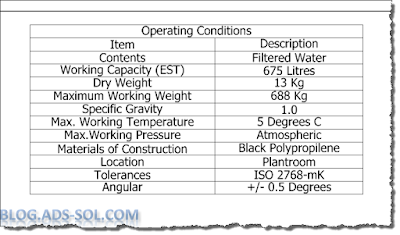 oContents(2) = "Working Capacity (EST)"
oContents(6) = "Maximum Working Weight"
oContents(10) = "Max. 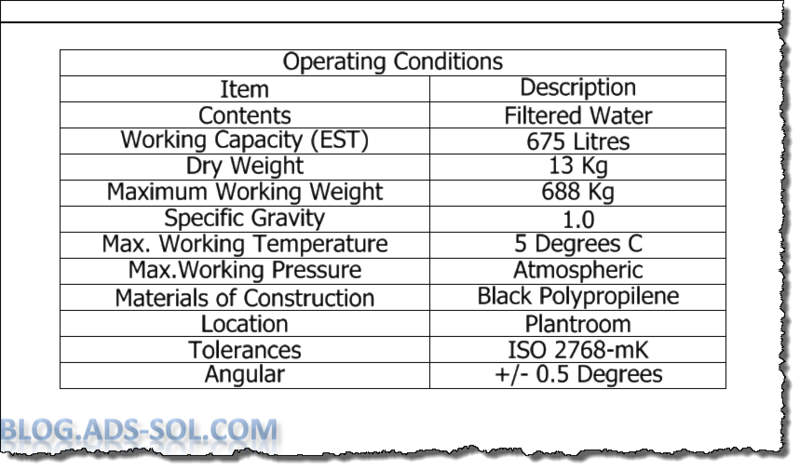 Working Temperature"
oContents(11) = "5 Degrees C"
oContents(14) = "Materials of Construction"
oContents(21) = "+/- 0.5 Degrees"
oCapEst = Parameter(modelName, "CapEst") & " Litres"
oDryWgt = Parameter(modelName, "DryWgt") & " Kg"
oMaxWgt = Parameter(modelName, "MaxWgt") & " Kg"